We're just 10 short days away from the biggest release in the history of Telerik, but before April 23rd arrives there is a secret to unlock! The public RoadMaps for Telerik's products have shared some of the details about the upcoming release, but not everything. The secret information is safely locked away and only you can unlock it before the 23rd. 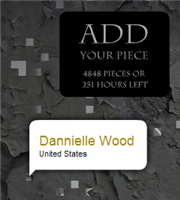 Watch your inbox for an email with a link or visit the Quest site directly to contribute your piece to the puzzle. Only after enough people have added their piece to the mysterious Q1 puzzle will all of the secrets of Q1 be revealed. So don't leave the community on a limb! Use your Client.net ID to add your piece the puzzle right now and bring everyone one step closer to unlocking the mysteries contained behind the puzzle. For those of you that have already done your part and added a piece to the puzzle, help pass the time and speculate what will be revealed by visiting the official Quest forum. What will the secret be? !